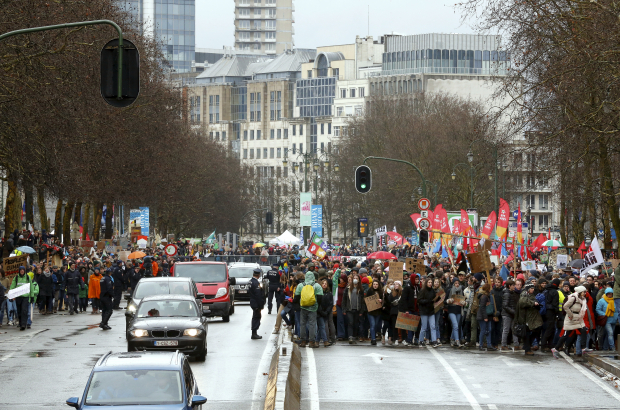 Police estimate that 70,000 people joined Sunday's Rise for Climate march in Brussels - a similar turnout to the last demonstration on 2 December. Protesters marched in the rain from Brussels North sation to the European parliament, with another 500 taking part in a similar march in the centre of Mons. Signs included: "No time to waste" and "Stop to company cars". "We weren't expecting so many people," said Kim Lê Quang from Rise for Climate Belgium, which organised the march to call for "strong and ambitious action against global warming". He added: "As long as there is no significant progress, the protests will continue." Sixteen people were arrested after they broke off from the agreed route and staged a protest near the prime minister's office on Rue de la Loi. In 2017, Belgium emitted 114.5 million tonnes of greenhouse gases - down more than 20% since 1990. The European target is a 35% reduction by 2030. Climate change is the tragedy of the commons, precisely because of NIMBY: every country and every industry pointing the finger at the others. Europe must lead by example because (to use another acronym) TINA.